AbeBooks - since 1996. "Passion for books." 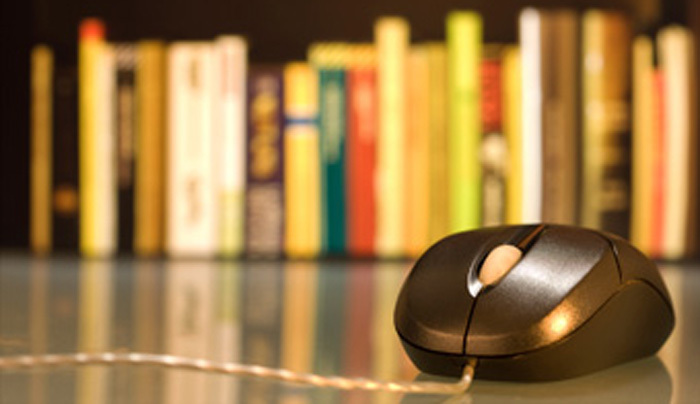 AbeBooks is an online marketplace for books. Millions of brand new books, used books, rare books, and out-of-print books are offered for sale through the AbeBooks websites from thousands of booksellers around the world. Readers can find bestsellers, collectors can find rare books, students can find new and used textbooks, and treasure hunters can find long-lost books. Alibris - since 1997. "Find Your Next Favorite Book." Online store that sells new books, used books, out-of-print books, rare books, and other media through an online network of independent booksellers. AMAZON.COM - as of February 22, 2016: 57,590,067 books. ANTIQUARIAN BOOKSELLERS' ASSOCIATION OF AMERICA | ABAA - "Antiquarian and Rare Books." BARNES & NOBLE - Internet's largest bookstore: "We stock over 1 million titles for immediate delivery - that's more titles than any other online bookseller." BOOKFINDER.COM - search for new & used books, textbooks, out-of-print and rare books. BOOKMAN - used, unique and out of print books. BOOKMOOCH.COM - "Give books away. Get books you want." Exchange books and trade them, like a book swap or book barter. BOOKS-A-MILLION ONLINE BOOKSTORE - buy discount books, music, movies, magazines. COMIC CONNECT - the online marketplace for comic buyers & sellers. DE GRUYTER - since 1749. For more than two-hundred and sixty years the name De Gruyter has been synonymous with high-quality, landmark publications in the humanities and natural sciences. FOYLES - fiction, medical, textbooks and more at our London store and online. HARVARD BOOK STORE - since 1932. HARVARD UNIVERSITY PRESS - since 1913. Independent Online Booksellers Association | IOBA - "Find books on IOBA." International League of Antiquarian Booksellers | ILAB Rare Booksellers - since 1947. "The World's Best Books, the World's Best Booksellers." ILAB represents 1,850 of the World’s best booksellers dealing in fine, rare, old and collectable books in all fields. Search for them and their books. OXFORD UNIVERSITY PRESS - founded in 1586. The largest university press in the world. PENGUIN BOOKS - UK book shop and online bookstore. Powell's Books - since 1971. "Used, New, and Out of Print Books. We Buy and Sell." Claims to be the largest independent new and used bookstore in the world. PROMETHEUS BOOKS - a leader in publishing books for the educational, scientific, professional, library, popular, and consumer markets since 1969. RANDOM HOUSE - bringing you the best in fiction, nonfiction, and children's books. Read by Famous - "From Their Hands To Yours." We sell books that were owned and read by people who have achieved high levels of recognition in their particular fields. Not copies of titles they have read, but the actual books that these people owned and read. SIMON & SCHUSTER - new book releases, bestsellers, author info & more. TASCHEN BOOKS - publisher of books on art, architecture, design and photography. TENEUES PUBLISHING GROUP - leading book publishers in the areas of illustrated books on photography, design, lifestyle, travel, collector's editions, luxury photography books and pictorial calendars. The Book Depository - since 2004. "Millions of books with free delivery worldwide." UK-based online book seller with a large catalogue offered with free shipping to over 160 countries. W.H. SMITH - "1,000's of books to suit all tastes." Books, audio books, bestselling hardbacks & much more.